Learning to manage your time effectively is an important life skill. Our pages Time Management, Minimising Distractions and Avoiding Procrastination provide an introduction to general time management skills. This page covers time management techniques that you can specifically apply to your studies. Everybody has different aspects of life to balance, work, family, personal life and studies. In order to benefit from your studies you will need to feel that you have some measure of control over your study time. Gaining control of your time requires some thought and planning. Ineffective time management means you get less done. This, in turn, can lead to stress and anxiety, which are common problems when trying to juggle the demands of a busy life. By developing your time management skills you can alleviate many of the triggers for negative stress and work towards finding a positive and healthy work/life balance. See our page: Tips to Avoid Stress for more information. Effective time management also enables you to work your way, systematically, through your studies – breaking large tasks into smaller, more quickly achievable sub-tasks. This in turn can lead to a greater sense of achievement as you progress, you can tick things off your ‘to-do’ list. 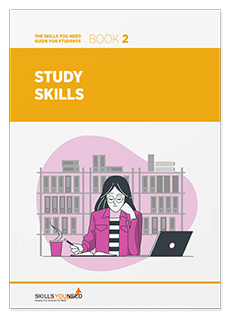 This enhanced sense of achievement will help boost your confidence and enable you to develop your study skills further. It is important to understand, however, that time management for study is not just about managing the quantity of your study time – the time it takes to complete tasks. Managing study time effectively also involves monitoring your personal energy levels and your current feelings about study. Doing so can help you to stay motivated and committed to your study. In other words, time management for study is being aware of your own personal limitations, knowing when to work and when to stop. It is as much about the quality of your time as it is about the quantity of time needed for study. You may find our page: Minimising Distractions which provides a general discussion of time management tips useful. A timetable adds focus, pattern and structure to your study. Timetabling will enable you to review each section of your studies, establishing the key tasks involved and identifying the time slots when you will engage with them. Creating a learning timetable will help you to overcome procrastination and unnecessary dithering. You will find it useful to develop some sort of personalised system for organising your study time. This will allow you to decide what needs to be done and when. Without such a structure a lot of time can be wasted procrastinating or being distracted by elements of the study process. You might find yourself starting one thing and then another and wondering whether they are getting anywhere. The aim of planning a study timetable is to identify or create regular time slots for study, ideally when you will be at your most alert, free from distractions and able to concentrate. Think about planning your study as an integral part of your life. This train of thought can go a long way to help you to maintain a positive attitude and a healthy work/life balance. It is important, when planning, to realise that study does not take place in a vacuum but needs to be organised around your other fixed commitments, like work and/or family. This may involve looking at regular activities that could be moved, done less frequently, delegated or deferred whilst you study. Depending on your circumstances it may help to involve other people, colleagues, peers, family and friends in the planning process to, where possible, gain their understanding, cooperation and support. When you create a study timetable that you can share with others it will help them to feel included and involved. It will also act as a reminder to them that there will be times when you should not be disturbed. It is important to schedule ‘free-time’ into your timetable. Such time can be used for relaxation, and social activities, things that help you achieve a balance. Having ‘free-time’ slots also means that there will be an element of flexibility built into your timetable. If a task needs extra time or there are some unexpected developments you have a built in a way of coping. You also need to think about how much time you need to devote to study as you plan and draw up a timetable. If you are a full-time student you’ll obviously need more study time available than a part-time or casual student. Once you have considered all of the points above and thought about your own circumstances, start to prepare a timetable. It is usually easiest to think in terms of weeks when you design your timetable, although this is a purely personal exercise so use whatever suits your circumstances best. Split up each day, in a logical way to accommodate your commitments – if you are a student then mark when you will be attending lectures or seminars, when you will have chance to speak to tutors and when you’ll have time to work on your assignments. If you work then mark out the blocks of time when you will be at work. If you are a parent, especially of younger children, then note the times when you need to be doing the school run, spending quality time etc. Block off known commitments first and see what time you have left for study. Keep your timetable template and update your timetable each week. If you have a fairly regular routine the chances are that the timetable will not have to change much over subsequent weeks. Once you have decided when you will (or can) study, you will need to look at the specific tasks involved, what you will actually be spending your study time doing. Try to allocate the tasks that require most concentration, writing assignments for example, to study slots when you will be most alert and free from distractions. Tasks such as skim-reading books, periodicals or internet resources, to note if there are any relevant sections, may not require as much concentration. At the start of each week draw up a task (to do) list for that week. Tasks may include reading key sections of a book, sourcing new information, planning an assignment or researching a particular area. Allocate the tasks to relevant study slots on your timetable. This will help you to keep track of your progress so that you have an unfolding record of your studies and can backtrack if necessary. Keep a note of your progress; if you are unable to finish a certain task, try to avoid negative feelings; you may be able to use some of your ‘free-time’ the following week to complete it? As you progress through your study you will come to know how much can be realistically achieved in the time slots available and this will help you to plan more accurately. Cross tasks off your ‘to-do’ list once they are done. Remember that the object of the task or ‘to-do’ list is to avoid wasting time on issues that are not relevant or important. Goal setting is the key to successful time management skills. By setting yourself goals you enable yourself to focus on key learning tasks relevant to the area you are studying, as well as helping to clarify the way forward. Goal setting, when used in conjunction with a personal study timetable, will provide you with a structured pathway that can help guide you through your studies in a focused and calm way. Goals give direction to your personal learning and development and will enable you also to track your progress, boosting your confidence and morale. Specific – Make goals clear and precise, to the point. Exactly what do you want to accomplish? Measurable – Think of ways to measure how you are progressing with your goal – how will you know when the goal is achieved? Attainable – You need to make all your goals realistic and obtainable. If you set yourself unrealistic goals then your self-esteem will take a knock when you can’t achieve them. Relevant - Make sure your goals are actually relevant – do not spend time working on achieving something that you don’t need to. Relevance also means thinking about the order in which you work on goals. Time Scaled – Finally, you need to set timeframes, or deadlines for achieving goals. You should make allowances, however, for the fact that timescales may well change as you progress – some things, inevitably, take a lot longer to achieve than you originally thought. As you become more practised at setting personal goals so your timings will become more realistic. See our page: Setting Personal Goals for more on SMART.